I-10 stretches across the southern part of the country, running from Santa Monica, Calif., to Jacksonville, Fla. It serves as an important link for freight moving between the ports in Los Angeles and Houston. In Arizona, the grant will support signs along I-10 that digitally display information about available parking at rest areas in Bouse Wash, Burnt Well, Texas Canyon and San Simon. Another goal for the project is to improve safety. If a trucker runs out of service hours, he or she will sometimes park in an unsafe location, such as the shoulder of a highway or ramp. Herrmann said readily available truck parking information should help drivers locate a safe place to rest. Beyond that, he said trucks parked on highways and ramps can create the need for maintenance repairs in those places. “The primary thing is to help the truck drivers find a safe place to rest so that they’re rested when they’re on the roadway. That’s really what the goal of this is,” Herrmann said. TxDOT spokeswoman Emily Parks said that the agency is still determining what specific technology will be used for this project. She said officials are considering various technologies, such as in-ground sensors, video detection systems and dynamic truck parking capacity signs. 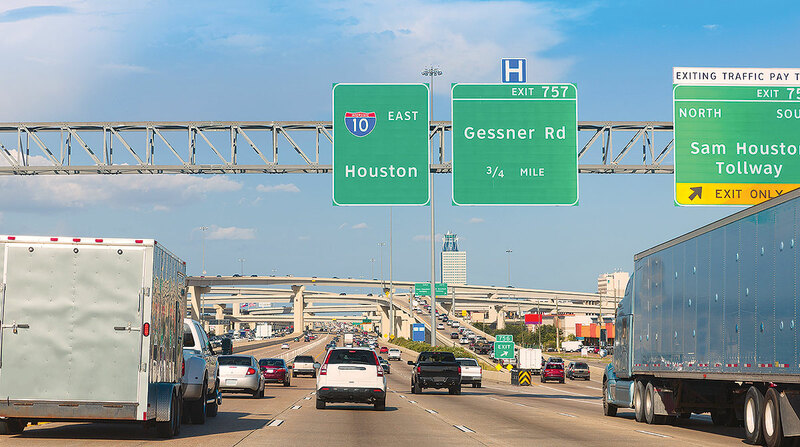 John Prewitt, president of Texas-based Tideport Distributing Inc., identified interstates 10, 35, 45 and 69 as the ones his drivers travel most. Based in Channelview, Texas, just east of Houston, Tideport Distributing specializes in transporting hazardous materials, such as petroleum. Prewitt serves on the American Transportation Research Institute’s Research Advisory Committee, which unveiled its list of 2019 research priorities March 25. Developing standards for truck parking information systems based on driver preferences topped the list. Lack of available truck parking ranked No. 5 on ATRI’s list of industry concerns, which was released Oct. 29. John Esparza, president of the Texas Trucking Association, said other regions, such as the eight states represented by the Mid-America Association of State Transportation Officials that developed their own information sharing program, have served as a model for truck parking projects. ATRI President Rebecca Brewster said it’s encouraging to see states work together on truck parking solutions. “When you think about the nature of freight movement, it’s not limited just to state borders, so it is good to see these systems crossing state lines to bring greater connectivity for systems to provide information to drivers,” Brewster said.